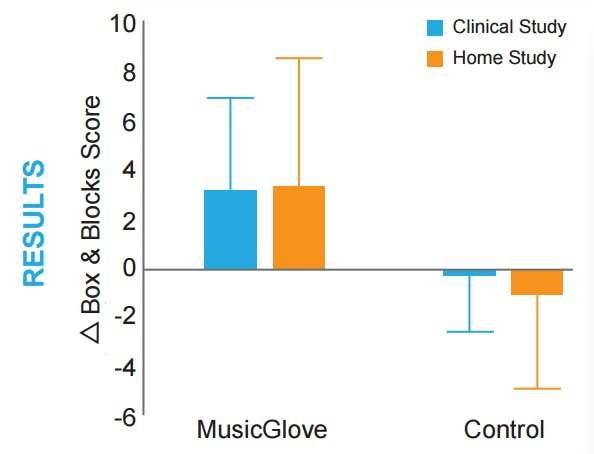 In a randomized controlled trial, subjects demonstrated significantly greater improvements in hand function pre- to post-assessment as measured by the Box and Blocks score after two weeks of training with the MusicGlove compared to participants that performed conventional tabletop exercises (see right). Participants also reported regaining the ability to perform functional movements with their hand, such as buttoning a button, brushing their teeth, and opening doors. 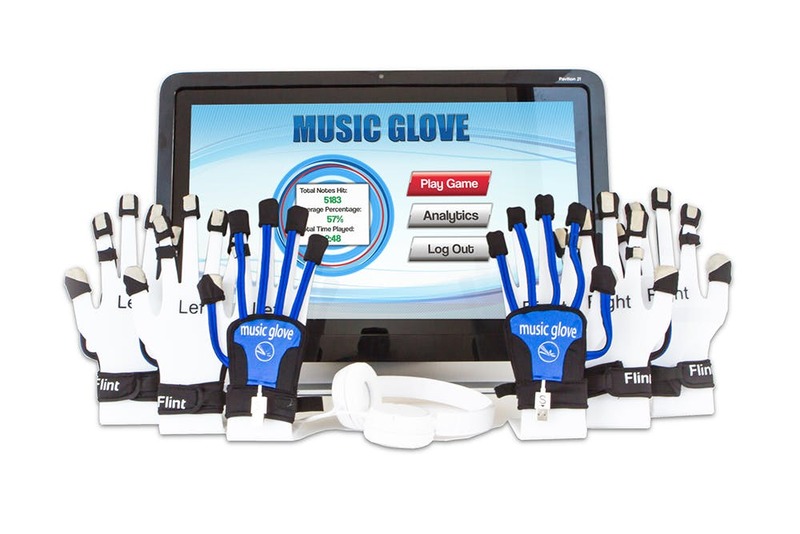 The MusicGlove can also assess hand function, since the score obtained in the game correlates significantly with established clinical measures of hand function (such as the Box and Box test, p < 0.001). 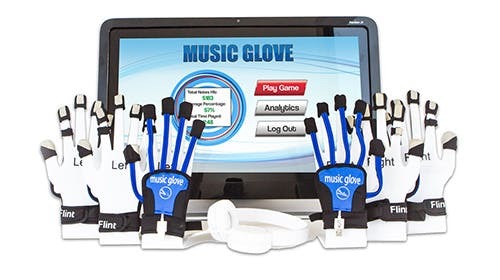 Want to try MusicGlove with your patients to see if it’s a good fit for your clinic? 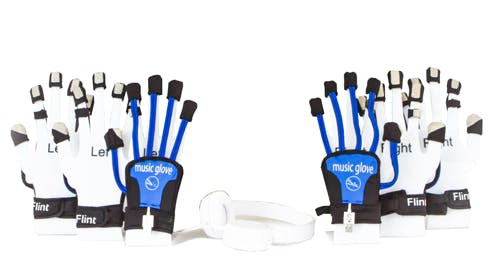 MusicGlove Therapy can be billed as neuromuscular reeducation or as a therapeutic procedure/exercise (i.e. CPT codes 97112 and 97110). We offer shipping within the continental US, Hawaii, and Canada. If you choose to purchase MusicGlove, we accept returns at any time within 30 days of purchase. If you are unsatisfied with MusicGlove for any reason, simply contact us and we will send you a prepaid return label. How much does MusicGlove cost for the clinic? The clinic version of MusicGlove ranges from $2,393.00–$2,992.00 depending on the console you wish to purchase. The $2,393 version comes with software that you can install onto one computer or laptop and 6 gloves. The $2,592 version comes with a 10″ touchscreen tablet with preinstalled software and 6 gloves. The $2,992 version comes with a 21″ touchscreen computer with preinstalled software and 6 gloves. How much does MusicGlove cost for my patients? If your patient has a laptop that is less than 5 years old, then he/she can use the software-version of MusicGlove, which is $349. 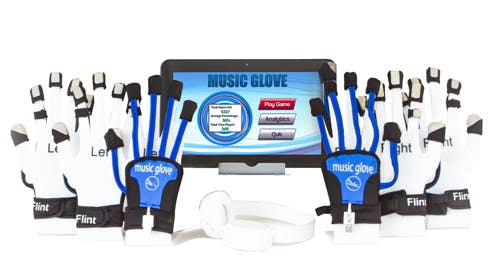 If your patient does not have a laptop, then he/she can purchase MusicGlove with a 10″ tablet with preinstalled MusicGlove software for $549. Will insurance cover MusicGlove for my patients? Unfortunately Medicare does not cover restorative technology currently in the US. For this reason, we offer a 30-day money-back guarantee so that your patient can be sure that they’re satisfied with their MusicGlove home therapy device. Can my patients use MusicGlove with no hand movement? However, if your patient cannot make that movement but are still interested in MusicGlove, then please read this article to determine if you’d like to try using the device passively. How can my patients maximize their progress? To maximize your results using MusicGlove, we recommend following our Recommended Regimen (click here to view the PDF). 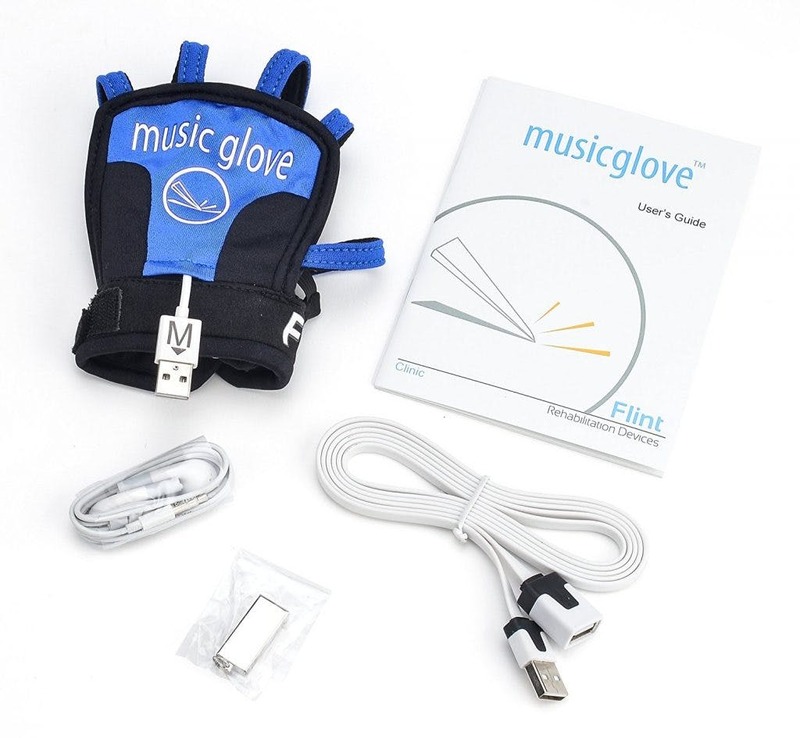 Ready to Try MusicGlove In Your Clinic? Choose a MusicGlove variation below, or request a custom quote!